How can the proper notion of the State be restored? 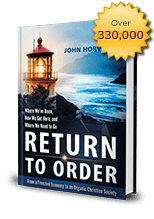 Join the DebateJohn Horvat II, the author of Return to Order, regularly updates this site with insights about the cause and solution for our economic crisis. He invites you to share your insights too. Please join the discussion. Mr. Horvat is committed to make a serious effort to answer posts, schedule permitting. Some claim that we must tolerate the idea of a State as a necessary evil. Such hostile attitudes come from the fact that many see only today’s bloated and dysfunctional State and consequently have confused notions of what constitutes society, nation, State and government. We think that the State is the political organization and order of the nation; its role is to safeguard the common good and facilitate virtuous life in common. How can the proper notion of the State be restored? This entry was posted in Join the Debate by Robert Ritchie. Bookmark the permalink.